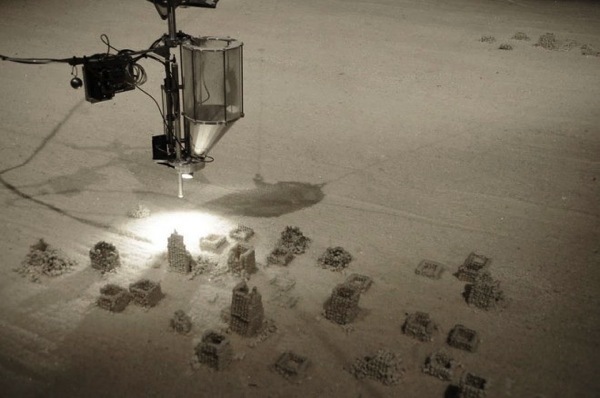 #3DxArt – Jonathan schipper: 3D Printed Salt “detritus” Interactive Installation (VIDEO) #3DThursday #3DPrinting #3D « Adafruit Industries – Makers, hackers, artists, designers and engineers! A new work in production will be an artificial continuously changing environment based on trash, salt, human will and hot water bathing. The piece will consist of a few tons of salt. There will be a mechanism that will be suspended by four cables. By varying the length of the four cables the mechanism will be able to move to most locations within the room. The mechanism will have the ability to extrude crude representations of average objects from salt. These objects will be things like old chairs, toilets, tires, washing machines and many other human specific objects we take for granted as part of our world. The viewer will be able to view these objects being created from the comfort of a hot water tub.